Happy Monday everyone! This past week has been very busy for me. I just began my final class at Le Cordon Bleu College of Culinary Arts Orlando. 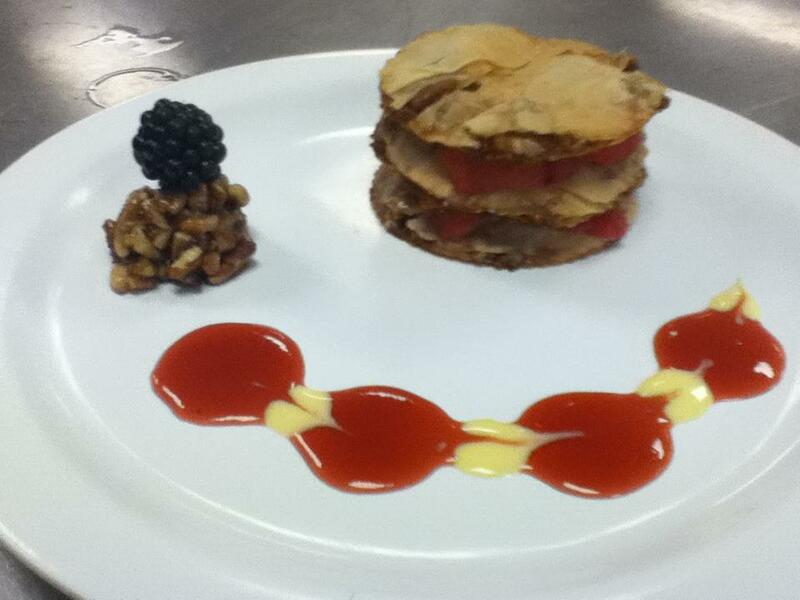 This class is Dessert Plating and it is a very demanding course to say the least. Not only is it crucial to understand all of the elements which are important to plating a high end dessert but also we have to create our own flavors and they must be creative and a bit risky. It has been difficult because in all of the previous courses students are held on a tight leash when it comes to what we would make in class. We had to follow the recipe in our textbooks or whatever Chef declared we must follow and we couldn’t deviate much from that in the ways of presentation or flavor options. With this class they basically throw you to the wolves and chef gets to sit back and watch with a grin. In week one of Dessert Plating, our simple instruction was to create a a few dessert sauces with our own flavor choices which would compliment our finished plates of non-traditional Napoleons due on friday. The first order of operations was to choose my two flavor stars for each plate. My first star I chose was Pumpkin. The second was Peach. 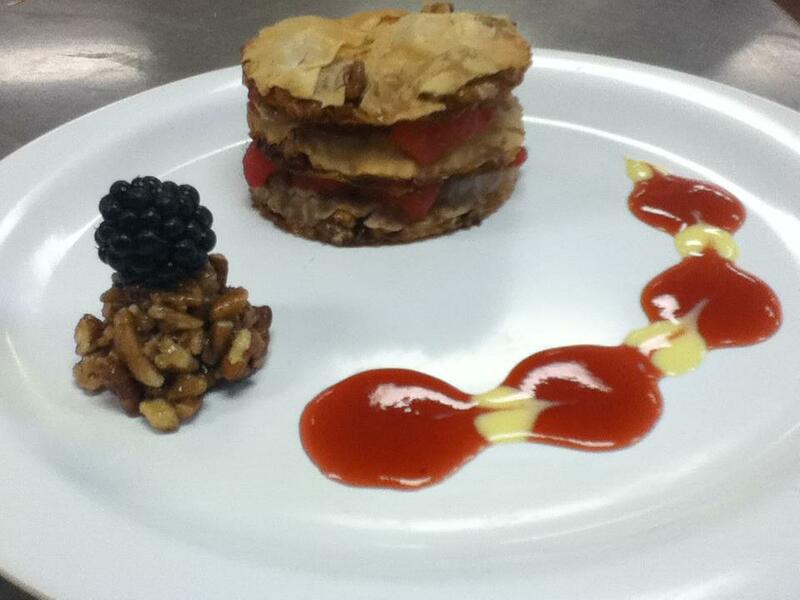 Let’s start with my first plating: The Pumpkin Praline Napoleon. For the first Napoleon, I was instructed to use sheets of Phyllo dough and enhance them in any way I chose. To do this I first melted some butter and added a praline flavor compound by Amoretti to enhance the butter with flavor. I delicately soaked my first layer of phyllo with the enhanced butter and spread a Praline mixture I created over the buttered phyllo sheet. My Praline mixture consisted of pecans, brown sugar, honey, and vanilla. I continued the layering process until I had about five sheets of Praline enhanced phyllo melded together. Before baking, I cut the phyllo layers with a metal fluted cutter to create the non-traditional circle shape. Once strategically placed on the baking sheet, it was to the oven for the phyllo. About 7 minutes later, caramel crisp goodness emerged and wafted in my direction. Once the phyllo layers were completed it was time to focus on filling options. I chose to flavor a basic pastry cream with Pumpkin and its complimentary warm spices of ginger, nutmeg, and cinnamon. To assemble the napoleon, I placed one layer of praline enhanced phyllo on the plate and used a pastry bag fitted with a star tip to pipe a round of pumpkin spice pastry cream in the center of the phyllo circle. To prevent any leaking pastry cream while waiting to present my plate, I lined the outer edges of the enhanced phyllo with fresh cut raspberries. This created a dam for any running pastry cream and also added complimentary flavor and texture. I repeated the process once more before placing my final round of praline enhanced phyllo on top. With the napoleon constructed it was on to decorative sauce creation and adornments for the presentation. 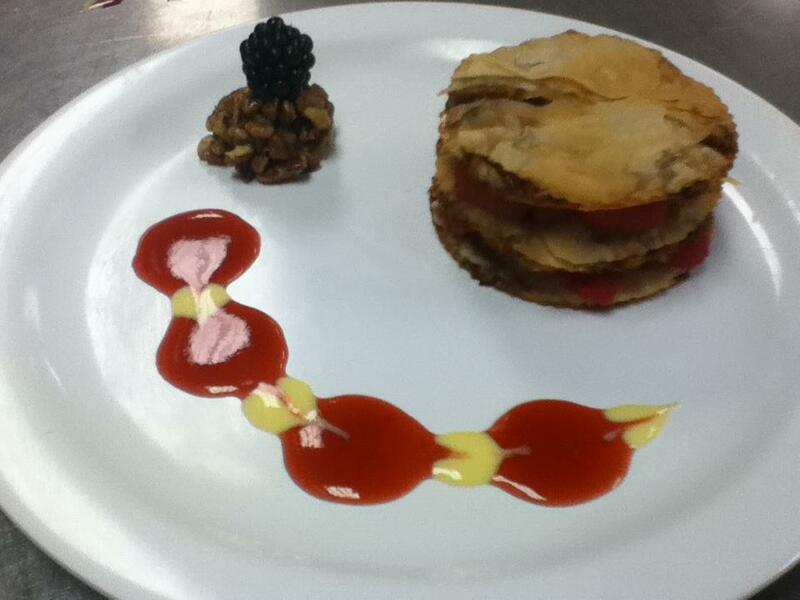 To compliment the raspberries I added to the napoleon, I created a Strawberry Rhubarb Rum Coulis. I placed four rounds on the plate all leading the eye toward the napolean. To add contrast to the red colored coulis and compliment the pumpkin spice pastry cream filling, I created a Maple Nut Creme Anglaise. I placed four rounds between the Coulis and drew a bamboo skewer through both sauces to add a finishing look to the plate. For the final adornment, I simply utilized leftover praline to prevent further waste. I shaped the praline mixture into a mound and topped it with a fresh blackberry. This added height, color contrast and it complimented flavors within the dish, which is of course important. 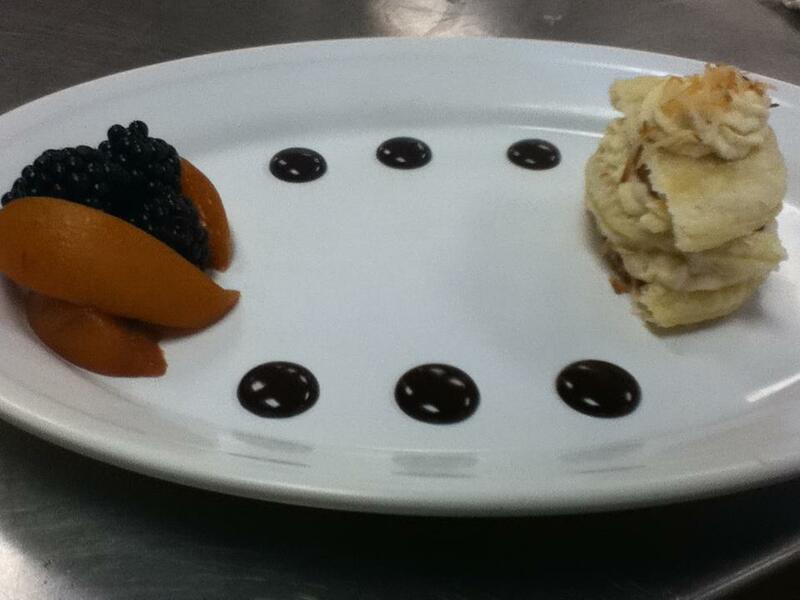 Now that the first plate was complete it was on to number two: The Spiced Peach Napoleon. For this napoleon I had to utilize puff pastry and again enhance it. I laid out a sheet of puff pastry and cut it into rounds again using my fluted metal cutter. When melting the butter I enhanced it with a dash of cayenne pepper to add heat which would later compliment the sweetness and other spices. Once the butter was melted I brushed it over the sheet of puff pastry in order for my enhancement to stick…that being Toasted Cayenne Coconut. Once the puff pastry had fully baked and cooled, I proceeded to use a bench knife to cut each circle in half. This created another non-traditional shape, that being a half moon. To fill the puff pastry layers I opted for a Peach Mousse. To assemble the napolean I placed one puff pastry moon on the plate and again used a disposable pastry bag fitted with a star tip to pipe a small amount of peach mousse onto the pastry. I then topped the mousse with a spiced poach peach, which I will describe in a moment. I repeated the process once more but alternated the direction of the half moon. After placing the final layer of puff pastry, again alternating the direction for an even more noticable non-traditional shape, I piped a rosette of peach mousse and topped it with some of my remaining Toasted Cayenne Coconut. As for the decorative elements to this plate, I made sure to incorporate sauce and fresh fruit for added textures, tastes, and colors. As mentioned previously, I created Spicy Poached Peaches not only for the napoleon but also decor. I poached the peaches in red wine with whole allspice, black peppercorns, and a cinnamon stick until tender. 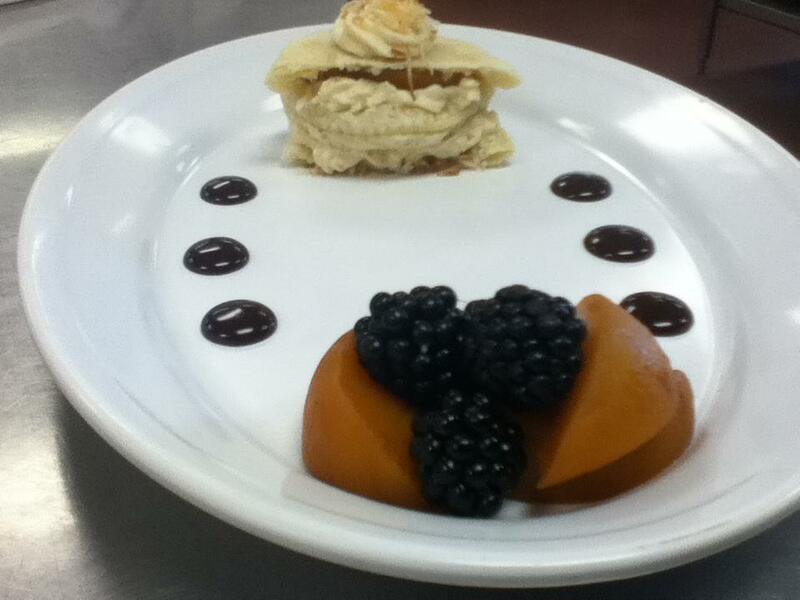 For plating I aligned three peaches to create an abstract basket to hold the fresh blackberries. This created additional color, shape and complimentary flavors for the rest of the plate. This all leads to the final element on the plate, the sauce. The sauce I chose to create was chocolate. This added a distinct color which popped off the white plate and also added contrast to the other colors. To make the chocolate flavor meld with the rest of the plate, I enhanced it with Tangelo and Orange Blossom extracts made by Amoretti. These are wonderful jewels to have in any pastry kitchen as they give great options for creating epic flavor profiles in any dish, whether culinary or pastisserie. 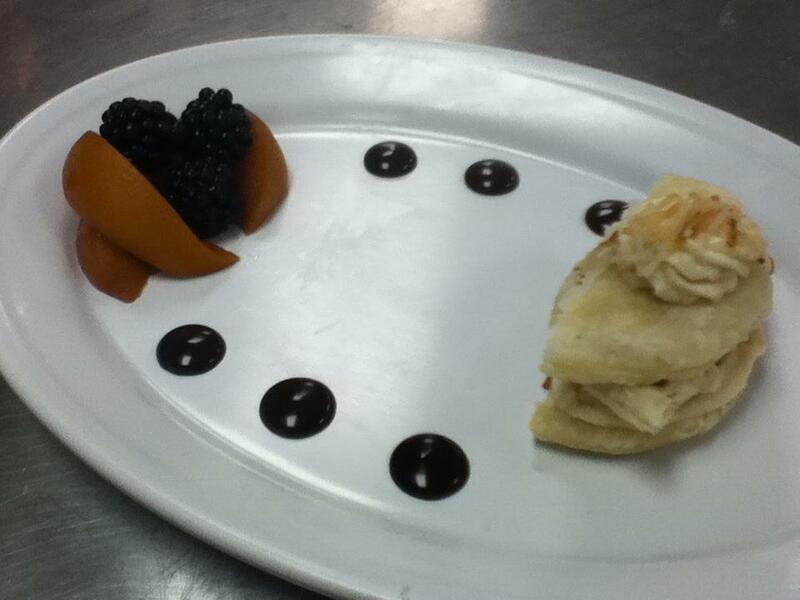 I placed the chocolate sauce in three simple dots on each side to draw the eye back and forth between the bushel of peach and berries to the napoleon.